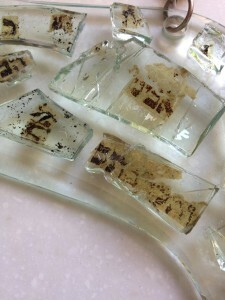 Our Torah was a entrusted to us by the Westminster Synagogue of London and the Holocaust Torah Museum and Trust. Click here to read the remarkable story. We are grateful to Ron Seger, Torah scribe, for the restoration of the Torah. The Ark was specially designed and constructed by Earl Appel, Rabbi Stan’s brother-in-law, to fit our Torah and to be portable so we can move it each year from Rabbi Stan’s home during the year to the Brandeis Bardin Institute for High Holy Days. Our first mantle was designed by Eva Robbins and included a Ruti Hafsadi (an Israeli artist and friend) tallis, hand painted on silk. The Tree of Life Torah Rollers & Breastplate were made for our Torah by Ray Moskowitz, a Holocaust Survivor. 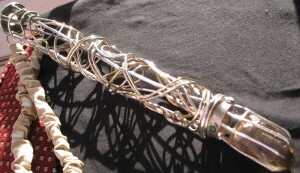 This Torah Mantle was created by Karen deMille as a meditation on Y*H*V*H, the most sacred name of G-d, which when written vertically forms a figure dancing in the midst of the concentric circles representing the Sephirot, cradled in a protective hand. Created on plush dusk colored silk velvet, it’s hand embroidery is comprised of rayon and metallic threads, a variety of iridescent beads, crystals and freshwater pearls. 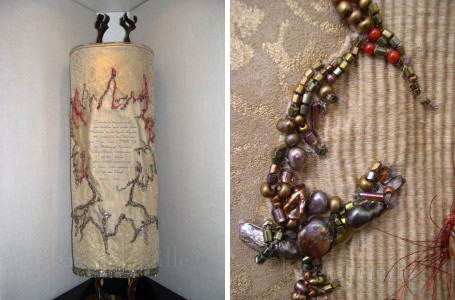 The Legacy Torah Mantle was created by Karen deMille as a meditation on the burning bush, and is dedicated to the Jewish people of Bohemia in the Czech Republic who perished in the Holocaust, from whence the B’nai Horin scroll originated. The base of the mantle is fabricated from gold imprinted sheepskin which is appliquéd with golden silk that is embroidered with a silk, ribbon and metallic threads, then encrusted with beads, crystals and freshwater pearls. The Hanging Letters Breastplate was contributed by the family and friends of Barbara Greenberg Hill and dedicated to her memory. It contains some of the original letters from our Torah, suspended in acrylic. The original breastplate broke and Ray reconstructed it. 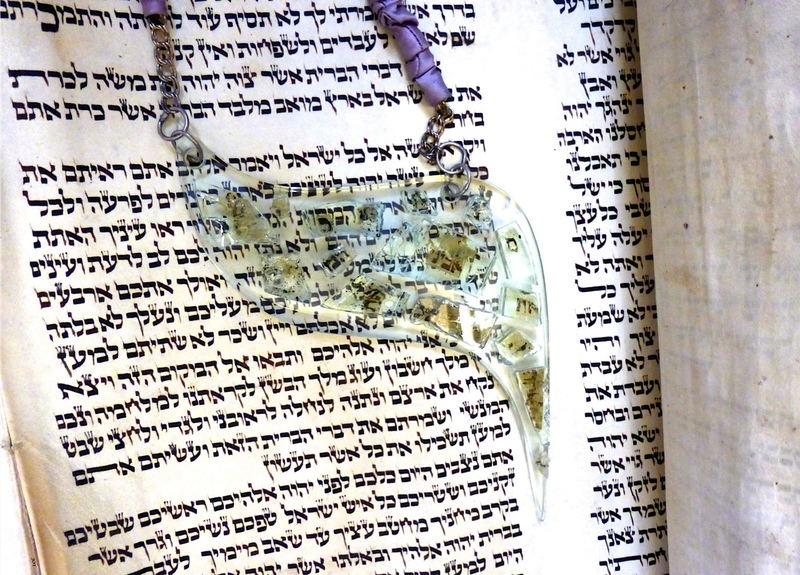 The Yad was created for our Torah by Holocaust survivor Eva Nathanson, who is a silversmith and contains a crystal found on Mt Sinai by Yael Taubman. Created as a gift for Rabbi Stan Levy this Tallit literally wraps him in the blessings of his community. 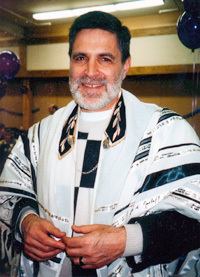 Rabbi Stan’s Tallit was created out of our desire to demonstrate to Rabbi Stan how much he was loved by his community. In a series of brainstorming sessions with Peggi Sturm, Gayle Gale, Karen de Mille, Stacey Rosenbaum came up with the concept: Have everyone write a blessing, prayer or message to Stan. Then heat transfer that blessing to ribbon and sew the ribbons onto the Tallit. Gayle, Karen and Stacey took responsibility for the organization and execution of the project. Many “secret meetings and communications” later, the blessings were gathered and the hard work of sewing began. With the help of Michael Barclay, Jacqui Dumais, Barbara Goldfus, Joy Krauthammer, Deborah Mayer, Charlotte Lynn, Eve Robbins, Charles Sherman and the many others who participated the Tallit was completed. It was presented to Rabbi Stan at our Hannukah Celebration in 1997, along with a Tallit Pin by our resident silversmith, Eva Nathanson. And, he was surprised! And grateful and honored. Rabbi Stan has built our prayerbook over the last 20 years from a myriad of Jewish and other philosophical sources. In 1995 Stacey Rosenbaum and Joe Utsler undertook the project of a lifetime with Stan: to update our prayerbook, remove the gender bias, turn it from a collection of zeroxed pages into a real book and make it easy to read and attractive. In other words, over hundreds of hours, they typeset our prayerbook, in Hebrew and in English, added inspirational photos and drawings as well. It was ready in time for High Holy Days, 1997. So far, 526 people have purchased a copy to use and to treasure. We hope you’ll want a copy too.